Great BBQ and onion loaf and good cheer. 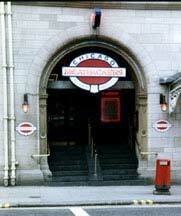 Ate and had a few pints here in the early nineties as NWA captain. Carried their discount card for years as our crews frequented this pub. I loved this place, great ambiance, great food, great times. The cocktails and pictures of beer with mates were awesome. Jealous that the Germans can still enjoy Chicago Meatpackers. Come back….Glasgow loved you. Did it have some kind of train thing that went round? !